This is who we are right now. We go back an forth between inner and outer growth. The world is turning into itself, meditating more on it’s condition, trying to practice peace and community spirit. At the same time we rely on artificial things, that only money can make and buy. We are lost without or phones but we are on a constant marathon to reach inner peace. 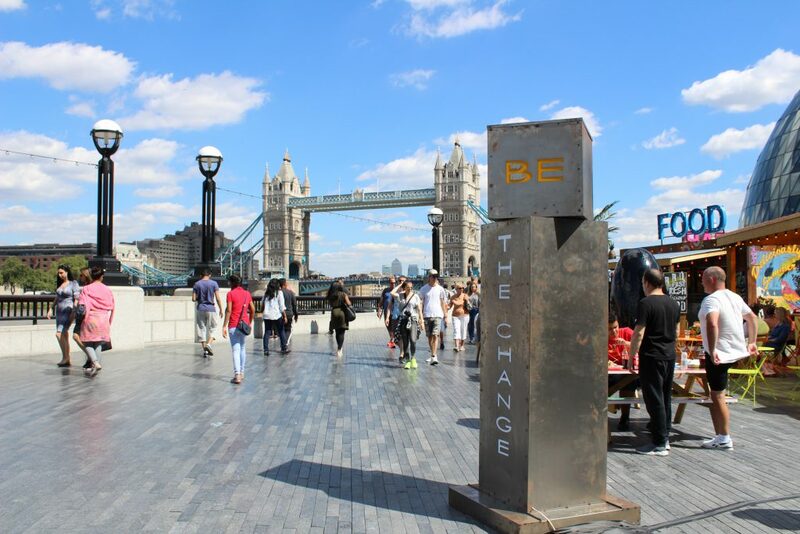 Be the Change (you want to see in the world) a quote from Mahatma Ghandi versus Keep the Change, the common expression that is a symbol of the financial plenty. Can we be one or the either or are we always trying to reach balance? We live in a time where we are slowly becoming something else and this continual struggle between leading a responsible life and slipping into a sort of superficial of comfort is defining us, everyday. This piece speaks about this bipolarity and its continuous dynamic. This piece speaks about acceptance in a society that finally accepts all and everything, where you can be yourself, whatever that implies, without being one way or another.